I keep finding lots of iron with this, but it also gets ALL signals, such as coins, etc. I think the discrimination range in this accepts iron more than some current detectors, so relic hunters might like, it, and I'm sure it's fine on gold and nickels. It does seem to see everything and anything in the soil, so I never think I won't see what I'm after, just does get sometimes more signals than I need or want. It's quite sensitive, and does go deep. It can see a dime I have in a test bed in my back yard at 8.5 inches deep. The pinpoint is great, right on, and the machine has a quality feel. I like how the batteries drop in and you don't have to use clip on terminals, so no problem there. The built in speaker is nice and loud and audio signals are quick recovery speed and crisp sounding. The coil is the same as the more expensive models, and I really like it. It feels quality, as does everything on this machine. It looks and feels cool. I like the older fisher detectors better than the F series, unless I could get a higher model, such as a F5 or above. My only gripe is pretty small, that the knob on discrimination/on/off is larger and easy to bump. Great grab and go detector for all around detecting and good on tot lots, etc. I grade tough because I've had a LOT of detectors, including a Tesoro Vaquero, which is like this but more modern and more pricey, but I still give this one 4 of 5 stars, even if I'm picky and know my stuff. 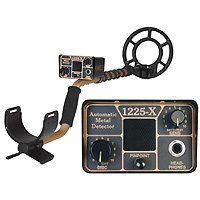 Great detector, easy to use and inexpensive too. You can find everything you want with this detector and 1 hour of practice. To Joe in Essex England, trust me turn down your discrimination to 2 or less and you will find the gold!! You will dig a lot more junk on 2 disc but if you leave it up on 4-5 someone right behind you will find what you miss. I am over 200 rings and counting so far and think this has to be the best hobby ever!! I bought one of these machines new. I paid $150 shipped for it off of CL, and I must tell you, it has been a real joy to use. I have found lots of nice coins with it, and my first weekend out, I found two silver quarters. Easy to handle, and the discrimination works really well once you get the feel for it. Well made and goes deep! If you find one of these and are in the market for a simple to operate machine, buy it. Please listen up, the fisher 1225x is a good little machine for the price and it will find gold, discrim down to 2 sensitivity high as you can go, now if you think you have a dirty great lump of iron just bang up the discrim wait for the chatter walk away, if in doubt just dig crikes wot do you want from a £100 machine. UK user and its a good back up machine. I brought my machine from a friend who thought it was rubbish, I have to disagree because I have found so much with it. I've found hammered coins, silver romans, crotal bells, but no gold. I have my sensitivity on full and my disc on 4 or 5, it does pick up a lot of iron but I think if you have your disc up too much you have a chance of knocking out little coins. Its a good all round machine for little money. I got this metal detector(1225x) off ebay for 100bucks. It is lightweight, very balanced and very sensitive. I have a much more expensive mxt, I waved a speck of gold over it(the 1225x) and it responded quickly, my mxt did not pick it up. It will be my gold hunting detector and my mxt will be for everything else. I purchased a Fisher 1225-X on Ebay about 3 months ago for about $150. Since then, I've found about $20 in clad, a Civil War bullet, and one 14K gold ring. The pinpointer is dead on and the depth reaching is more than adequate. It only weights 3lbs, so I can usually swing about 3 hrs, anything after that exhaustion kicks in. It's powered by two 9 volts, and I normally average about 20 days of swinging between changes. Therefore, the battery life is great. The only problem I have with the 1225X is that you have to set the discriminator down to 4 to pick up gold and silver. And that equates to either digging a lot of trash to find the rings and quarters, or missing the good targets if you dial a higher discriminator setting. So it's a give or take situation. I?ve also noticed that atmospheric discharge will cause the detector to act erratic. So beware of cloudy days. However, if you?re a coin hunter, set the discriminator to 6, max the sensitivity, and go hunting. At this setting for coins, it's usually dead on about 95% of the time. I highly recommend the 1225X for those new to detecting. As for me, I'm sticking with Fisher, and plan to upgrade to the F2 sometime this year. Hopefully my 17yr old son will inherit the 1225X. The body construction of this unit is flimsy. The knobs on this detector could have raised areas on them to set the detector better. The indication marks are painted on. It could be much stronger and more sturdy like tesoros silver umax. I have had my Fisher 1225X for 2 years now and like all the Fishers I have had in the past it is a great detector and priced right. The only problem I have with it is the locking ring, they need to give you a few more when you buy it. Just being plastic don't last too long.. Other then that a great metal detector. A wire in the coil broke after two months, so I missed a good part of a season waiting for the unit to be repaired and returned to me. The cheap plastic bolt holding the coil in place, well, doesn't. I had to buy a support for it. The unit is poorly balanced, causing fatigue quickly. It doesn't discriminate any better than much cheaper units. The no motion pinpointing is nice, but no big deal.